Inside a large industrial building in Jamaica, Queens, I sighed, taking a quick break from ripping staples off of fabric. My back was to the windows, but even if I wanted to look outside, I’d have a problem. A mountain of trash bags blocked any view, each stuffed with thousands of tiny fabric scraps from fashion companies around New York City. I had signed up to sort through the material, but after working for three long hours alongside five other volunteers, we had barely made it through five bags. Dozens remained. I was at the headquarters of FabScrap, a textile recycling company that processes material leftover from fashion production. They’re just one of many well-intentioned textile recycling companies that have bumped up against a painful reality: There is simply too much clothing to process. As it stands, 84 percent of all unwanted clothes end up in landfills, according to Newsweek. In New York City alone, this comes to about 400 million pounds thrown away annually — 6 percent of the city’s waste stream. Traditionally, unwanted secondhand clothes are sent abroad, but some countries have started to reject the goods. Technology to transform the old clothes into new items isn’t ready yet, so many recyclers and designers are focusing on something else: getting consumers to buy less. If you’ve ever dropped off a bag of last year’s clothes at Goodwill, you probably didn’t think you were contributing to waste. 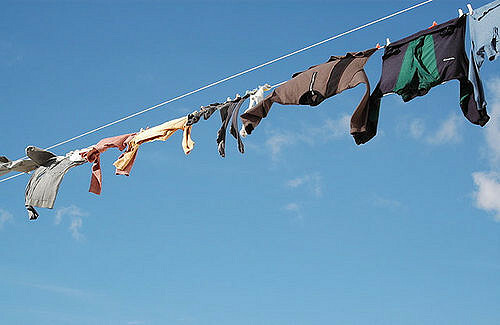 Although donating your clothes does extend their lifespan, the issue is their eventual destinations. “A lot of people have a misconception that their donations are ending up on the back of someone in need in your community,” says Jessica Schrieber, FabScrap’s founder. That’s not what happens, she says. The nicest clothes are resold in local thrift stores, but the vast majority of items head overseas, wrapped into enormous plastic bundles. Pakistan is currently the biggest importer of used clothes, with 11 percent of the market, followed by Malaysia, with 7.1 percent, according to M.I.T.’s Observatory of Economic Complexity. 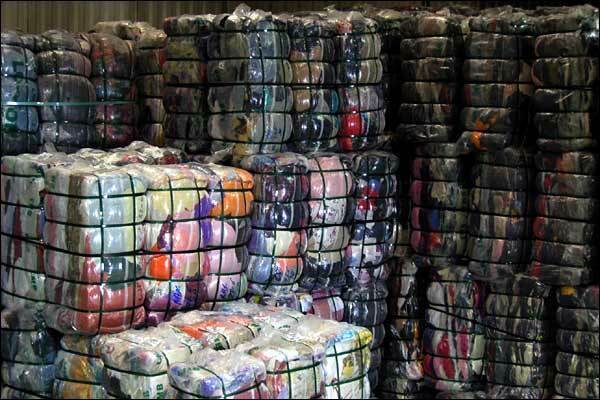 When clothes are in no condition to be worn again, they are shredded and put in insulation or furniture. And while it’s good for the environment to reuse these clothes, it creates ethical quandries. The U.S. has been criticized for the practice, which can erode local clothing markets and traditions. “No one really wants to be another country’s dumping ground,” Baruchowitz says. Recently, three East African countries stood up to the industry and initiated a ban on secondhand clothing — and felt strong pushback from American businesses. Since these East African markets are worth over $43 million, the loss could mean a blow to the American secondhand clothing industry — and that the clothes get shipped to a U.S. landfill instead. Even though exporting used clothes extends their life cycle, they still wind up in a landfill. Recyclers dream of finding alternative solutions. Meanwhile, American consumers are increasingly interested in buying secondhand clothing and might not be ready to scrap the current shopping model just yet. According to Forbes, the market is predicted to rise 11 percent — to $33 billion — by 2021. Trying to capitalize on this interest are designers like Tara St. James, founder of Study NY and a professor of zero-waste design at the Pratt Institute. She is hoping to take things one step further, by encouraging customers to buy less and buy sustainable designs. St. James is not only interested in addressing issues in secondhand clothing recycling but also the issues in traditional fashion production. “Most of the time it’s 50 collections a year — product comes straight off the runway in a couple weeks. It’s shockingly fast,” says St. James. These traditional designs create waste during the production process by using cheaper fabrics and spawning hundreds of scraps (like I was sorting at FabScrap), and afterwards, by encouraging customers to constantly buy more clothes. St. James, like many other zero-waste designers, has turned this model on its head. She incorporates scraps straight into new designs and debuts new clothes to coordinate with preexisting staples. Every piece is made with high-quality raw products, so that they can be worn for as long as possible. It’s a hard balance though, to incorporate her idealism and still make a profit. “I want to make a quality product with good resale value — and it’s hard to do that and tell your customers not to buy more stuff,” St. James says. Even when zero-waste clothes wear out, there’s no quick fix for getting rid of them. Consumers can either donate the clothes or throw them away. While slow fashion is trying to change how we shop, the current reality is that we are creating millions of pounds of textile waste with few good solutions. Plastic goods are typically melted down to be remade into another bottle or can, and there’s the same hope for clothing. Instead of heading to the landfill, a number of companies are aiming to reuse the same fibers by melting them down and using the product to create new fabric. Evrnu, in Seattle, is working on the problem in the U.S., and recently H&M and Marks & Spencer, in the U.K., debuted clothing made from old fibers (none of these businesses would comment for this story). These changes are happening slowly. Sweden recently drew attention for burning H&M clothing for fuel, since that’s still cheaper than trying to reuse the low-quality fabric. This has some in the business doubting that advancements in recycling technology can truly save the day. “I don’t think [tech] is the ultimate answer, but I do think it’s a valuable bridge solution,” Baruchowitz says. For him, the problem lies simply with how much we’re consuming. The ideal would be for consumers to buy less and throw less away, he says. For St. James, this means creating high-quality clothing with sustainable textiles; Baruchowitz and Schrieber are focusing on education. Both FabScrap and Wearable Collections are soon moving to larger locations, trying to enlist more volunteers to sort clothes and learn about the recycling process. Donating your clothes does extend their lifespan and you can see that what you were throwing in the dustbin is not a waste but a help to the poor. This charity is a blessing for the person you are giving to. Ove my 70 years the quality of clothes has steadily deteriorated. The difference is vast. The clothing is thinner, less substantial, does not hang well, does not feel nice, and looses what body it has in the wash, and generally falls apart more easily. Clothes also have simpler , less diverse designs. So, if you do not love your clothes, you just go out and buy more. I used to go to stores and wish I had money to buy lots of things. Maybe it is my age, but I see few things in the store that wow me. Sweaters and coats ate no longer made from wool, and wear especially badly. Worse of all they are not warm. So, people must put the heat up higher in their houses, and probably are less prone to take public transportation, in the winter, since it involves walking in the cold. I still have lovely old coats, which look new. My older sweaters look better than anything I can buy today. Cotton sweaters are particularly prone to wear, and they are getting thinner all the time. I recall a sweater I had that was soft wool, and did not pill. I wore it so many years that that it eventually wore out in the elbows. I sometimes head to thrift and consignment shops because their older clothes are better quality than what is available today. I suspect the simpler thinner cheaper clothing may be driven by the economics of the industry. Somewhere along the supply chain the power must be concentrated, less competitive, and as a result consumers no longer have good choices available. The Government statistics show the price of clothing has not changed over the years. But, given that it is now produced by cheap labor, and given the much poorer quality, and given technological advances, I should think it acutally should be cheaper. Have profits of garments gone up over the years? Several retail chains have gone out of business over the last twenty years, so they may not be the culprit. Maybe CEO compensation is one of the drivers.